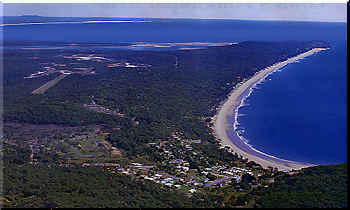 Agnes Water is directly on the ocean front and has the most northern surf beach in Queensland. Its great weather and get away from it all ambience make it a perfect holiday location. Some 6 kilometers north of Agnes Water is the Town of 1770, so named after the visit of Lieu. James Cook in May 1770. This was Cook's second landfall in Australia, the first in Queensland so giving rise to the area's claim to be the birthplace of Queensland. Bustard Bay, Round Hill Creek, the white beaches, crystal clear water and landscape have changed little since that day in May 1770. Fishing is great either in Round Hill Creek or out on the offshore reefs. Great Barrier Reef and fishing cruises are available from here. Turkey Beach is closer to the Great Barrier Reef than virtually anywhere in Queensland and protected Rodds Harbour is a fisherman's paradise laying claim to some of the best mud crab areas in the country. Joseph Banks collected plants from the diverse vegetation communities of the area. Here broad sandy beaches are backed by low dunes. There is a camping ground at Bustard Beach but campers must be self sufficient and the nearest supplies are at Agnes Water, 25 kilometers away by road, or the Town of 1770, 4 kilometers away by boat. Mt Colosseum forms an impressive skyline with hoop pines towering over a dry rainforest. The park is undeveloped to visitors must be self-sufficient. From the summit, experienced climbers are rewarded with a view of the offshore islands. Four wheel drive wehicles are recomended.